Deep within the walled city of Covenant, Captain Markus watched as robed figures with sticks chased after street urchins. He yawned. “Waste of time,” he thought. This happened every week. Priests of Kalnor held their weekly Underfeast, where the children of the street, the lowest of the low, were given a free meal. Of course, being the church, this also included a mandatory morals lecture. Most of the children would attend willingly, opting to sit through a boring sermon for a belly full of terrible meat. The reluctant would also attend, being fed and talked down to whether they liked it or not. They’d pretend to listen to Father Artos so they could eat and get out of there. The stubborn would be chased in by priests wielding sticks. Come noontime, they’d all be cast out of the church, and most of them would begin stealing again. Markus turned from his balcony. At least Artos, with all his misguided attention, was able to provide a worthwhile distraction, and today might actually yield some substantial fruit. Markus summoned his guards. “It’s time,” he said. Artos smiled as the last of the children filed into the Lower Nave of the Central Church. He had been doing this for many years now. He knew most of the children would not care, but if he reached even one, it would be worth the effort. They could already smell the cauldrons of meat from the kitchens. This was not by accident. This was the price of a free meal, and it assured their attention. “Hello, children!” His voice boomed despite his years, and was carried by the unique architecture of the church interior. His speech was well-rehearsed, and he rarely deviated. He smiled the smile of one whose life purpose was clear, and whose conscience was assured. Some yawned. Some others looked around. A few listened with rapt attention. Artos played to them all. “At one time, the gods would battle. They created worlds, and their power was such that these worlds, and the champions that lived there, became dust within the blink of an eye. The stories ended too quickly, and they agreed to create a new world, one that would not be broken. Artos added a quick flourish. “Danabrae, the promise, where the gods craft their stories, their songs, their EPICS!” The children, even the bored ones, sat up. It was a moment, crafted by an expert. Outside, Markus crouched in an elevated alleyway near the Central Church. He was informed that somebody was going to crash the Underfeast. Somebody that Markus had wanted to meet for a very, very long time. The ranks of the rebels were growing. This was unlike the rebellions of the past, which fell easily given the dwindling ranks of starving peasants against the coffers of the King. No, this was different. The rebel leader, Paros, was finding new recruits somewhere. Paros, he had been informed, was finding these recruits at the Underfeast. They were disgruntled and impressionable urchins and had no responsibilities. They could go wherever they wanted, without notice. Nobody would miss them. She could train them as she wished, filling their heads with her propaganda nonsense about freedom and honor. She was going to sneak in there today, and Markus would be waiting. In the church, Father Artos continued his speech. Paros listened intently. In between pauses in Artos’ speech, she could hear movement in the passage beyond the kitchens where she had hidden herself. As a mark of respect, she would not bring a blade to the House of Kalnor, and without it she could easily blend in as one of the children. With her hair cut short, she could pass for about 15 or so, but her disguise left her weaponless, and she knew she had to be careful. The speech would last about seven more minutes. Paros had heard it hundreds of times, both as a recruiter and as one of the children. Some of her earliest memories were of the Underfeast. Even now, she found that she missed the low-quality stew that the church served. There was nothing as strong as a smell to bring back a memory. A smattering of nervous, polite laughter gave Artos a moment to gather himself for the final push. This was a pleasant but exhausting process. It had the virtue of being consistent, at least. 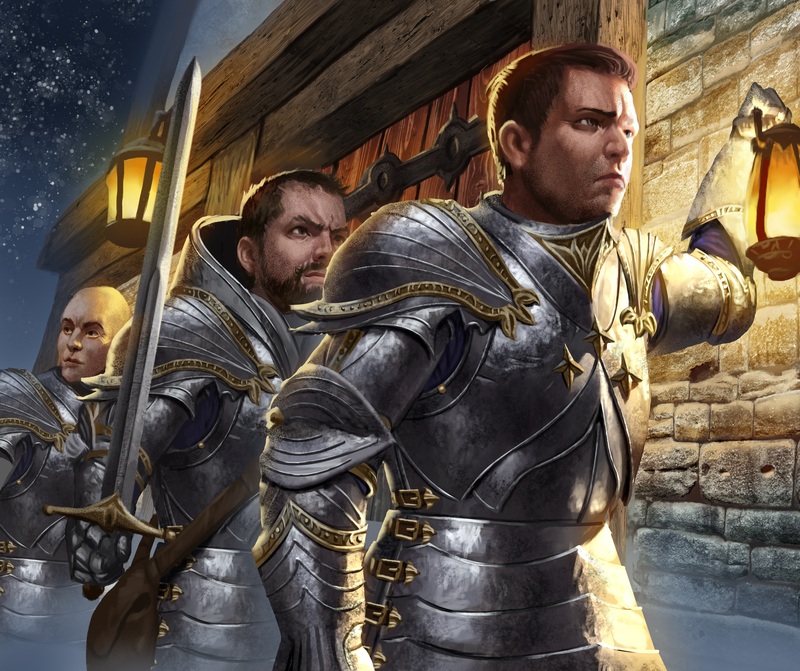 Markus stepped onto the street and, flanked by his guards, crossed the main thoroughfare with arrogant purpose. “She’s already inside,” he explained. “That’s the only thing that makes sense! 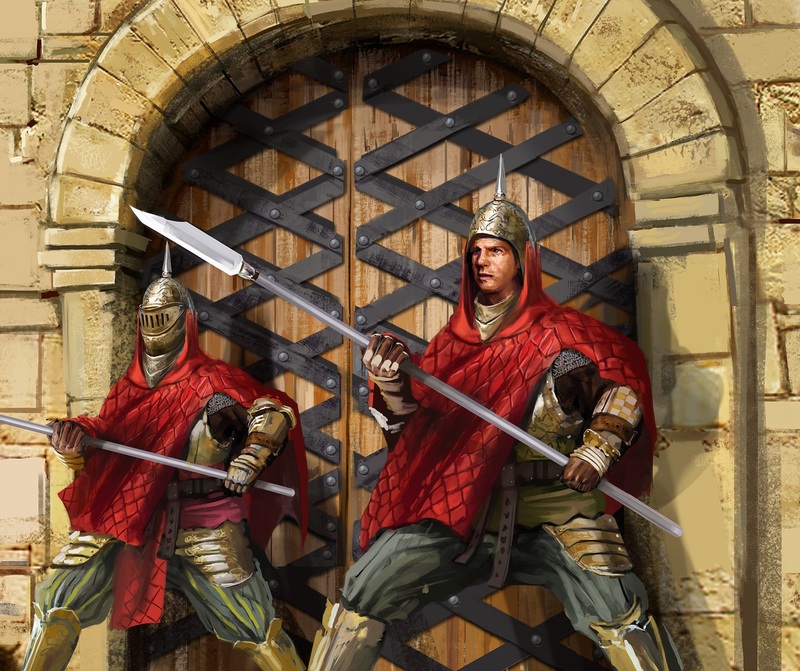 Watch the door!” Markus pushed past the priests that had been assigned to laughingly ‘guard’ the door, and entered the great cathedral. Paros heard the crash of the main door to the Lower Nave. This was new. That door was not supposed to open until after the feast! She slipped across the kitchen and silently watched. In 31 years, since the start of the Underfeast, Father Artos had never been interrupted. He wasn’t certain how to proceed when the main door flew open, revealing a stone-faced man with the uniform of a Watch Captain. By the time the stranger had made his way through the crowd of dirty, tiny people, Artos had dropped his grandfatherly front, and became the fire-and-brimstone priest of his youth. “What means this invasion of the Holy House of Kalnor?” he bellowed. The children all reacted with fright and shock. This was a different person before them. Gone was the boring morals lecturer, with his terrible jokes and sly, winking smiles. This was a commander of men, whose will was not to be disobeyed. Markus, if he was at all surprised by the transformation, showed no sign of fear. He looked around the room, scanning for a face he was certain he would not easily find. “I am looking for a criminal,” he said. Markus pointed a gauntleted finger directly at Artos. “I will leave, old one, when I have what I have come for!” He turned to face the children. Most of the faces looked confused. A few immediately avoided his gaze, including a young boy of about 11 seated very near him. Markus shot forward and grabbed the boy. The boy cried in terror as Markus held his sword blade to the boy’s throat. His intent was not to kill, but to scare. This was always an effective tactic when interrogating children, especially with more as witness. Markus looked up at the rest of the crowd as he held his prisoner by the neck. He had their attention now. They would all see that the law could not be fooled, mocked, or ignored. Markus realized too late that the children were not looking at his interrogation. Rather, they were looking past him. Had he turned a second earlier, he might have seen the vague shape of a young woman as she ran silently from her hiding place, and leaped from Artos’ stage. He felt her presence a split second before a kitchen knife found the gap in his armor, and embedded itself in the shoulder of his sword arm. Shoving the boy aside, Markus spun around, grabbed his sword in the other hand and blindly lashed out, only to have it expertly plucked from his grasp and flung harmlessly to the side. Markus lunged forward with his good arm, but Paros was already back atop the stage and beyond his reach. “This is why we fight!” yelled Paros. “You cannot fight the law!” yelled Markus. The rebel leader raised her bloodied fist and the children roared. Markus was already calling for his backup guards, but the noise of five hundred street urchins drowned him out. Artos was rushing from one side of the stage to the other, desperately trying to regain the room. Paros left quickly, having used up the day’s luck, and Artos had the unenviable task of grabbing the attention of a roomful of children, all jeering and shoving the enraged lawman. His sword long gone, Markus started shoving and kicking his way through the sea of laughing faces. Before long, he made it to the door of the Lower Nave. “Guards!” he yelled. The two closest City Watchmen ran to his aid. Eight minutes later, Markus once again burst through the door of the Lower Nave. This time, three dozen Watchmen flowed in behind him. “Yes, my child?” said Father Artos. “Where are they?” demanded Markus. Their voices echoed around the mostly empty chamber. “The children? Oh, well the Underfeast is concluded. The children opted to not eat the prepared meal, but no matter. They feasted on the words, you see?” Artos smiled in a way that Markus wanted to punch. “Captain, we cannot,” said one of the guards. 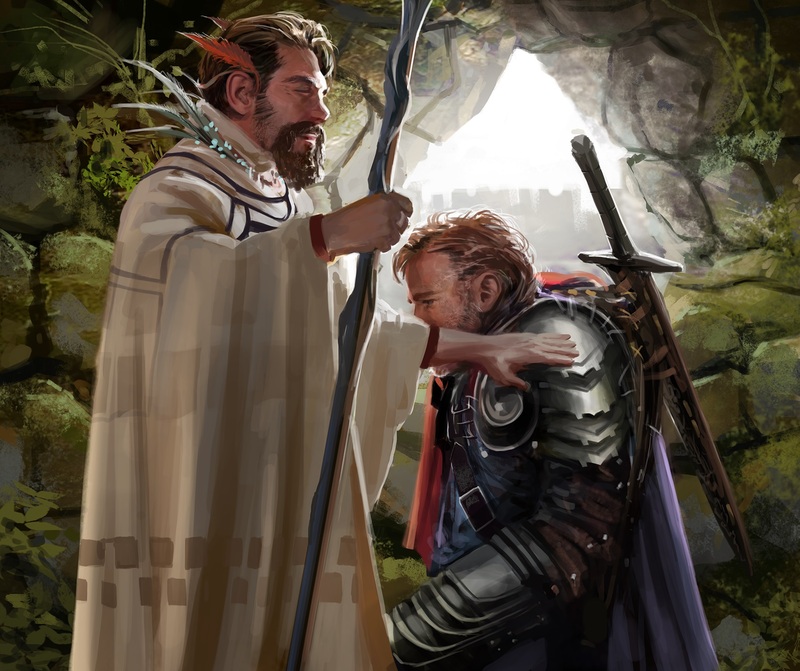 “You cannot arrest a priest of Kalnor on holy ground. I am familiar with your law,” said Artos. Some of the Watchmen took a step towards the door. Markus refused to back down. He could imagine this smug priest, locked in the Dungeon of the Keep, begging and pleading for food, sunlight, or whatever comfort he had taken for granted in a near-forgotten former life. But he knew he couldn’t win. Not today. Father Artos smiled. His face once again gentle and warm. “Yes. Yes it does.” He turned and walked back into the Lower Nave. He intended to put the acolytes to work cleaning up after the children. And then he would give thanks to Kalnor. 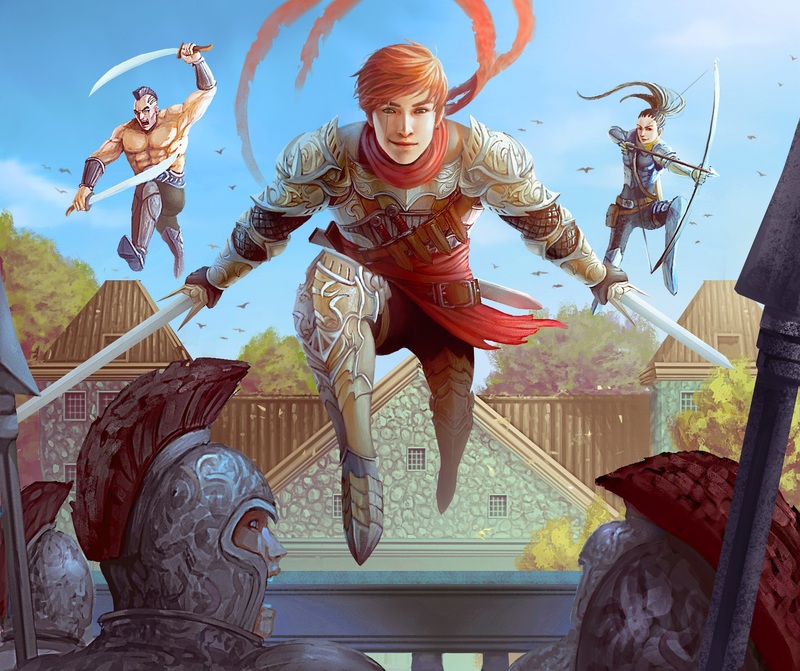 Author’s note – While the base set of Epic is fairly open, we had a really good opportunity to tell a great story with the expansions. With Tyrants, we had characters, and those characters had stories to tell. Covenant was a good way for us to do some exposition. What’s better than an old man telling a well-crafted story? I wrote Covenant fairly early, and I had no idea just how much it would make me want to write. Add in some fun action scenes, and some cool (slightly cheesy) dialogue, and you have the start of something that might just grow. I wasn’t sure what to name the world. Danabrae grew on me fairly quickly. I’ve always loved Celtic names, and I grew up reading Sláine. However, different people have different names for things. Who’s to say what the next civilisation will call the world where the gods play their games?